Baseball's non-waiver trade deadline passed Monday. Most players were relieved they didn't have to uproot their lives in the middle of the season, but there was one player who was so displeased that it cost him a spot in the lineup. You might know of him -- it was former top prospect and current Texas Rangers farmhand Jurickson Profar. Profar out of lineup tonight for Round Rock after he expressed frustration over not being dealt. Profar has spent most of the season in Triple-A, where he's batted .300/.386/.440 while primarily playing shortstop. 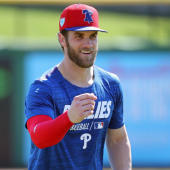 His annoyance likely stems from being in the minors, as well as having toiled the past few seasons to get his career back on track after being hampered by injuries. Thus far, Profar has tallied a 72 OPS+ for his major-league career. Not long ago, Profar was considered a future superstar. He entered the 2013 season ranked as baseball's no. 1 prospect by Baseball America, MLB.com and Baseball Prospectus. Evaluators were enamored with his athleticism and potential. His pedigree hasn't translated to a meaningful big-league career yet, though he won't turn 25 until February. It's unclear what the Rangers intend to do with Profar. He has exhausted his last minor-league option, meaning he'll have to stick in the majors next year or hit the waiver wire. The Rangers' current double-play combination -- shortstop Elvis Andrus and second baseman Rougned Odor -- is locked up through at least 2022, and it seems unlikely the Rangers would trade either and insert Profar in their place. As such, Profar might have his hopes for a trade granted after all -- he'll just have to wait a little longer. Given all he has gone through, what's a few more months?